The definition of a noose is a loop in a rope formed by a knot that tightens the loop as the rope is pulled, or is a restrictive situation. A knot in a rope that is used to trap an animal because it gets tighter as the rope is pulled on is an example of a noose. Restrictive trade restraints that hinder a nation's economy are an example of a noose. Noose is to form a slipknot that tightens when a rope is pulled, or to trap an animal using such a knot. When you use a special kind of knot in a rope in order to trap an animal, this is an example of when you noose the animal. "noose." YourDictionary, n.d. Web. 19 April 2019. 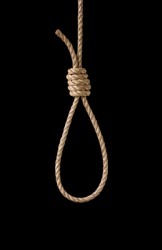 <https://www.yourdictionary.com/Noose>. anything that restricts one's freedom; tie, bond, snare, trap, etc. to catch or hold in a noose; trap, ensnare, etc. A loop formed in a rope by means of a slipknot so that it binds tighter as the rope is pulled. Also called running noose . To capture or hold by or as if by a noose. To make a noose of or in. Middle English nose probably from Old French nos, nous knot from Latin nōdus ; see node . An adjustable loop of rope, e.g. the one placed around the neck in hangings, or the one at the end of a lasso. To tie or catch in a noose; to entrap or ensnare. Probably from Old French nous, nominative singular or accusative plural of nou (“knot"). Compare node. The noose fell directly over the limb and he pulled it tight. For small work the box can be replaced by a canvas bag secured by a special tripping noose which can be loosened when the bag has reached the ground. In fluid movements, he shook out a noose, swung it a few times to get momentum and then threw it at the limb. Capturing his neck in the noose of her arms, she kissed him passionately.